In Amsterdam, hundreds of houseboats line the city’s canals and living on a houseboat is simply considered an affordable way to live in the center of the city. While Amsterdam may be synonymous with houseboats, houseboats are also popular in cities around the world. From London’s Little Venice to waterfront neighborhoods in Vancouver, Los Angeles and Sydney, one can find burgeoning communities. So why doesn’t New York—with its 578 miles of coastline—have a thriving houseboat community too? 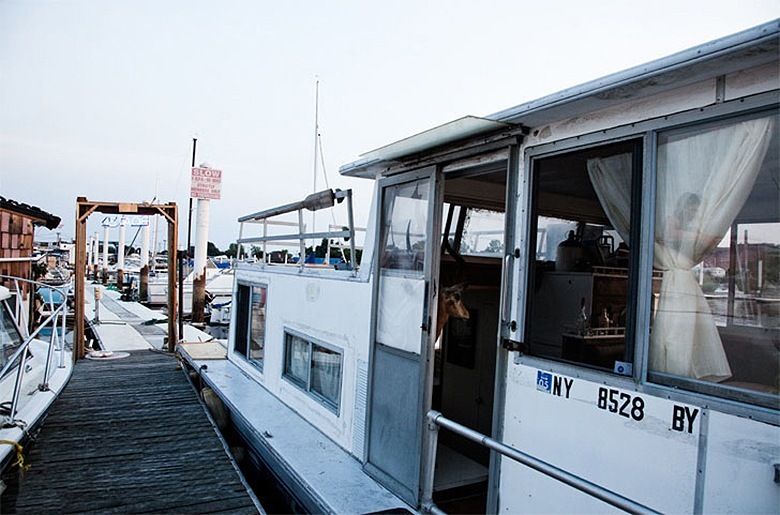 While it is impossible to know for certain how many New Yorkers live on their boats year-round, recent estimates for Manhattan suggest that year-round houseboat residents or “liveaboards” may now number fewer than 50. 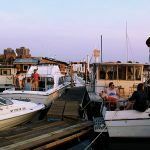 Limited year-round docking space and a general reluctance on the part of the city to encourage houseboat living are largely to account for the fact that New York reports far fewer liveaboards than many smaller cities. Regina Jordan and Ed Bacon, long-time residents at Pier 79 on the Upper West Side, recently told the West Side Rag, “We used to have about 104 year-rounders, now it’s down to 33 boats.” The couple also revealed that they pay less than $1000 per month in docking fees to live in the neighborhood. Houseboats are one of the most affordable housing options on the market, especially for anyone looking to own their own home. First, there is the relatively low cost of purchasing a houseboat. 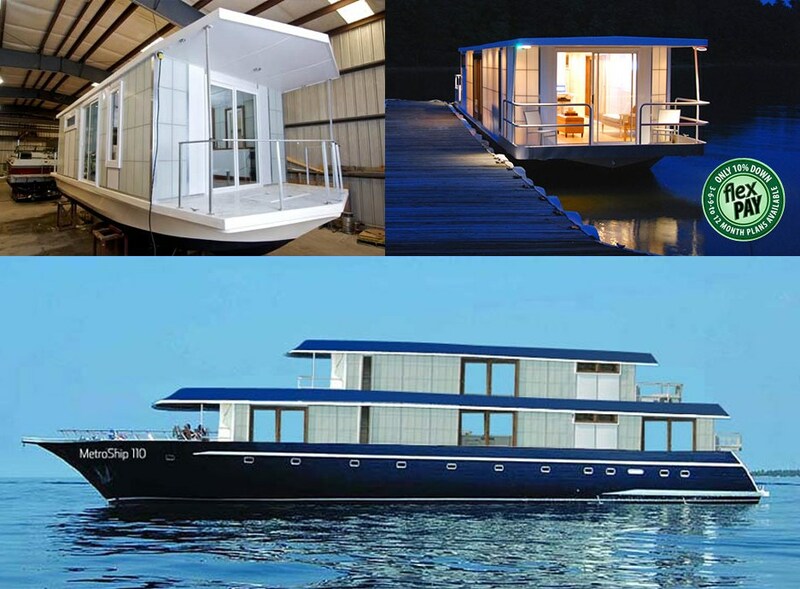 Larger luxury houseboats can often be purchased new for approximately $180,000. Used houseboats with less curb (or dock) appeal can be purchased for as little as $30,000. 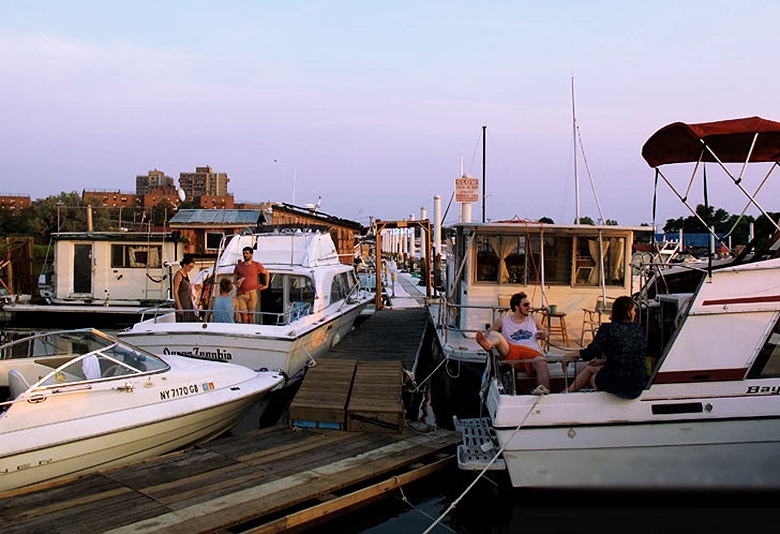 Docking fees are also typically far more competitive than condo or co-op fees. On average, one should expect to pay anywhere from $5,000 to $7,000 annually. Fees vary depending on the location and length of boat (a large houseboat docked at the 79th Street Pier on the Upper West Side will be cost more annually than a smaller houseboat docked further up the Hudson). 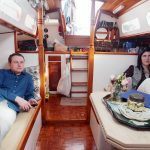 Nevertheless, even if one is carrying a loan on their houseboat, combined with docking fees, it is usually possible to live in one’s waterfront home for approximately $1000 monthly. Better yet, in most but not all U.S. cities, houseboats equipped with an engine are classified as vehicles rather than “floating homes,” and this means that most houseboat owners pay no property tax. There is another form of savings, however, that cannot be taken for granted. If your houseboat is seaworthy, but not all houseboats are, you may also enjoy considerable savings during the summer months. Rather than rent a vacation home at the Jersey Shore, on Fire Island or in the Hamptons, you’ll now have the option of simply pulling up your anchor and docking in a vacation community of your choice for a few weeks or the entire summer. Despite the substantial savings in terms of purchase price, monthly fees and property tax, houseboats do have one downfall. Unlike nearly any other home purchase, in the case of a houseboat, your home will depreciate over time, since the lifespan of most houseboats is only 30 to 40 years. 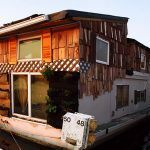 This means that while houseboats may offer substantial savings in the present, they offer no long-term return on investment. Although the savings and mobility of houseboat living may be attractive, there is no question that not everyone wants to live in a space that resembles Captain Hook’s secret living quarters. Fortunately, on the houseboat market, the nautical theme is out and modern minimalism is in. 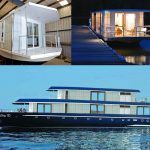 Just as it is now possible to purchase a slick modernist-inspired backyard shed or wilderness cabin, it is possible to purchase a houseboat that has all the aesthetic qualities of the very latest micro apartment. If this is your preference, the best place to get started is at Metro Prefab, which recently launched its MetroSHIP line. Ranging in from 35 to 110 feet, the MetroSHIP’s exteriors look a bit like floating Japanese lanterns, at least when illuminated at night. The MetroSHIP’s interiors reflect current micro apartment trends and features wood floors, white walls, scaled-to-size appliances and space-saving furniture. While the floor space of the smaller units does reflect the floor space of many micro apartments, MetroSHIP’s 48-foot two-level “loft style catamaran boat” and 100-foot “Superyacht” are spacious enough to accommodate an entire family. 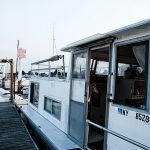 If you’re thinking about moving on to a houseboat, at least in the New York City area, the most difficult challenge will likely be finding a place to dock your houseboat. The waiting list at Pier 79 on the Upper West Side is already years long and despite protests by pier residents, the Parks Department appears to have no plans to raise the number permits for “liveaboards” in the Upper West Side or anywhere else. If you purchase a MetroSHIP, you may be in luck—the company has recently acquired some “liveaboard” dock space in New York (6sqft could not find out how much their dock space will cost or where it is located). Docking in New Jersey or moving up the Hudson are also options. 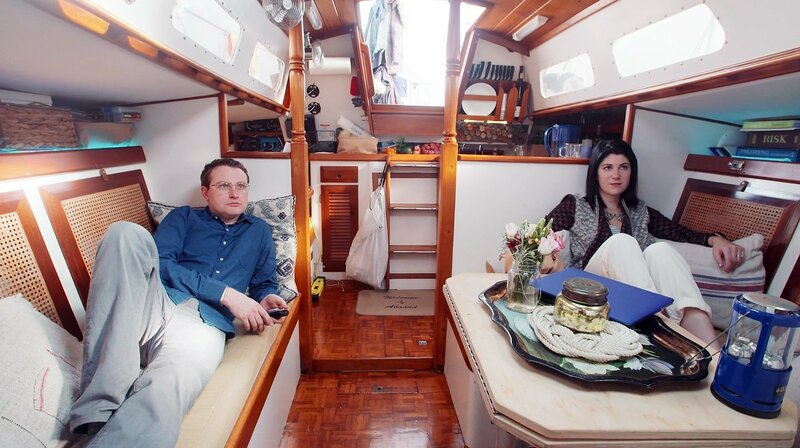 Like micro apartment living, living on a houseboat means making at least some sacrifices. Space will be limited, some appliances may need to be smaller than usual, and if you’re an antiquarian with several tons of old dusty books, you will likely need to rent a storage space too. For this reason, it is important to be clear about what your needs are in terms of space and amenities prior to purchasing your houseboat. Also, bear in mind that docking fees are by the foot, so going vertical (opting for a two-level houseboat) is nearly always more strategic than opting for a longer single-level houseboat. Another critical consideration is whether or not you plan to move your home from place to place. 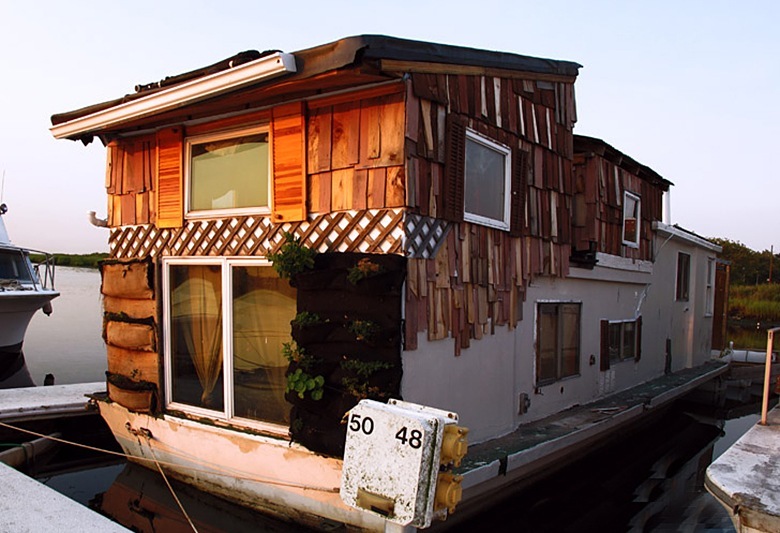 Traditional houseboats were typically built to be more house than boat. While they could be transported with the aid of a tugboat, they were not classified as boats but rather as “floating homes.” If you purchase a catamaran with an engine, however, you will have the option of moving your home from place to place. In most cases, there are still some restrictions—most MetroSHIP models, for example, are only insurable for use with 75 miles of the coastline. If you’re living on a houseboat, things can and will go wrong—it’s a boat not a full-service co-op or condo. This means that you’ll be saying farewell to your live-in superintendent and need to become your own super. In addition to typical home repairs, you’ll also need to be to oversee an entire new spectrum of tasks from re-gelling your roof and hull maintenance. This is likely why most “liveaboards” are also DIYers at heart. After all, while a leaky basement may be a nuisance, in a houseboat, a leaky basement will sink you into more than a bit of debt. If a hurricane hits, you’re better off in a high-rise than a houseboat. Indeed, during a hurricane, it is usually best to haul your home ashore. Deep freezes also pose problems for houseboat owners, since they can result in frozen pipes and leave you without running water or worse yet, water damage. Even during the summer months, living on the water can be both a blessing and a curse, since houseboats are known to quickly overheat. The bottom line is that if you’re living on a houseboat, rain, wind, deep freezes and heat waves will hit you just a bit closer to home. Could Bjarke Ingels’ floating shipping containers work for student housing in NYC? Funny, you start about the livingboats in Amsterdam, but you do not show any, pity!